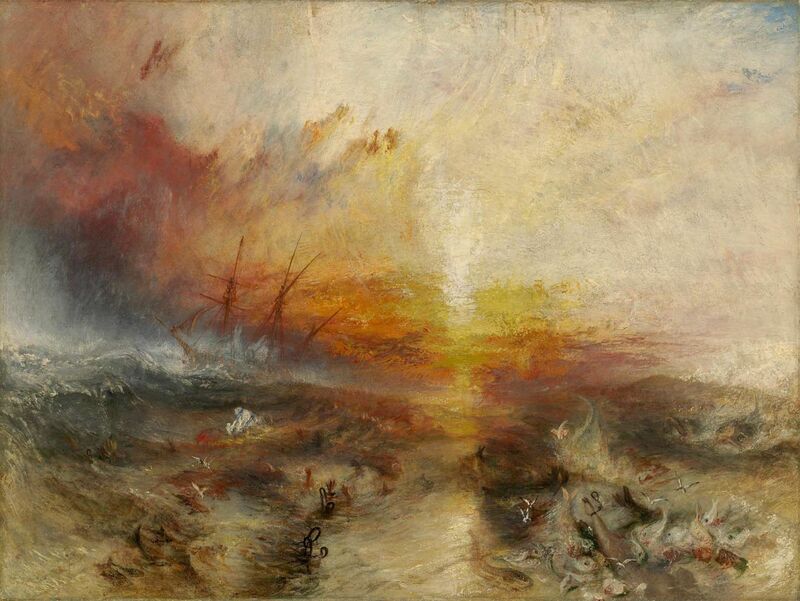 “But, I think, the noblest sea that Turner has ever painted, and, if so, the noblest certainly ever painted by man, is that of the Slave Ship, the chief Academy picture of the Exhibition of 1840. It is a sunset on the Atlantic after prolonged storm; but the storm is partially lulled, and the torn and streaming rain-clouds are moving in scarlet lines to lose themselves in the hollow of the night. The whole surface of sea included in the picture is divided like the lifting of its bosom by deep-drawn breath after the torture of the storm. Between these two ridges, the fire of the sunset falls along the trough of the sea, dyeing it with an awful but glorious light, the intense and lurid splendor which burns like gold and bathes like blood. Along this fiery path and valley, the tossing waves by which the swell of the sea is restlessly divided, lift themselves in dark, indefinite, fantastic forms, each casting a faint and ghastly shadow behind it along the illuminated foam. They do not rise everywhere, but three or four together in wilde groups, fitfully and furiously, as the under strength of the swell compels or permits them; leaving between them treacherous spaces of level and whirling water, now lighted with green and lamp-like fore, now flashing back the gold of the declining sun, now fearfully dyed from above with the indistinguishable images of the burning clouds, which wall upon them in flakes of crimson and scarlet, and gives to the reckless waves the added motion of their own firey flying. Purple and blue, the lurid shadows of the hollow breakers are cast upon the mist of the night, which gathers cold and low, advancing like the shadow of death upon the guilty ship as it labors amidst the lightning of the sea, its thin masts written upon the sky in lines of blood, girded with condemnation in that fearful hue which signs the sky with horrow, and mixes its flaming flood with the sunlight, -- and cast far along the desolate heave of the sepulchral waves, incarnadines the multitudinous sea. John Ruskin, Modern Painters, vol. 1 (New York and Chicago, IL: National Library Association, n.d.), pp. 382-3. Mark Twain, A Tramp Abroad (Hartford, CT: American Publishing Company, 1880), Part 4, Ch. 24. “When exhibited at New York’s Metropolitan Museum of Art in 1872, bewildered art critics dismissed The Slave Ship on aesthetic grounds. Turner’s flecks of paint had turned a sensitive historical subject (the slave trade) into a confusion of color ‘dishevelled enough to life the hair of an imperfectly initiated disciple.’…For many New York critics, The Slave Ship was simply a puzzle, and when the picture was put on the auction block in December 1876, most anticipated a foreign, probably English, buyer. Andrew Walker, “From Private Sermon to Public Masterpiece: J.M.W. Turner’s The Slave Ship in Boston, 1876-1899,” Journal of the Museum of Fine Arts, Boston, vol. 6 (1994): 6-7.